When Lightroom 6 was released, Adobe made a distinction between the normal version 6 which you could buy, and the CC version which came with Photoshop by monthly subscription. While 6 would continue to get updates, CC could include new features. While I’m sure this will annoy some and delight others, I’m going to put it to one side. Far more interesting is what has been added to Lightroom Mobile 1.5. Video is probably the most surprising new feature, but there’s also a Tone Curve and Hue / Saturation / Luminance adjustment sliders. But best of all, Mobile now has Black and White adjustment sliders. If you ever recorded video on your iPhone or iPad, it was a pain that you couldn’t use LrMobile to get them into the Lightroom environment. Perhaps sooner than expected, this obvious gap has now been closed. Movies taken on your iPhone or iPad can now be imported into LrMobile. What’s best is that you don’t really have to learn anything new. So in LrMobile I already have a collection that automatically imports anything new that might appear in my iPad’s Camera Roll. It previously picked up still photos. Now it also picks up new videos and syncs them down to LrDesktop in the same way as it handles still photos. One important detail is that at least for now, video import is limited to new videos that are added to the iOS Camera Roll. Sadly, you can’t yet add a video to a collection in LrDesktop and sync it up to LrMobile. But this is something I do want to do. For example, I’ve recently been making regular movies and timelapse sequences on my Nikon D800, editing them in Premiere Pro, and would like to see them in LrMobile alongside related still photographs. The same might apply to any movie made with Lr’s Slideshow module. So what can you do if you have a video on your computer and want it in LrM? In fact, all you need to do is find some other way to get the video into the iOS Photos app on your iPhone/iPad. There’s more than one route. 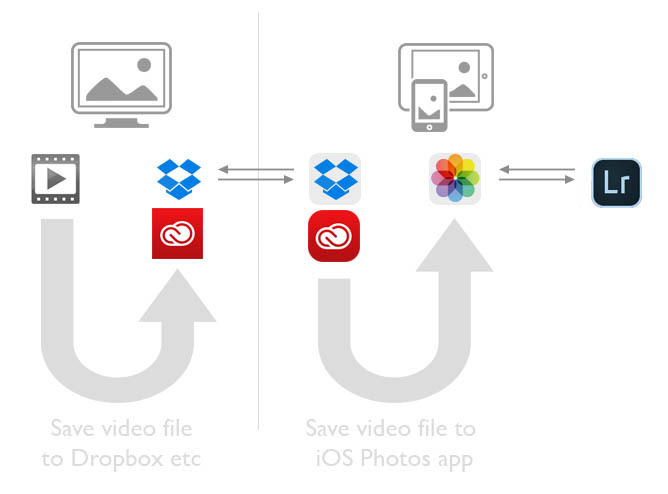 You could add the video to the iPhone/iPad using iTunes, but the way I prefer is to use Dropbox. After saving the video file to Dropbox on my PC, I then find it in the Dropbox iOS app and save it to the Camera Roll. LrMobile will then import the video and sync it to LrDesktop. I admit that this is a workaround, and therefore far from perfect, but I feel it’s good enough for now. I suspect Adobe are already working on the process and I doubt it’ll be too long before videos sync from LrDesktop to LrMobile. It’s such an obvious next step, isn’t it? 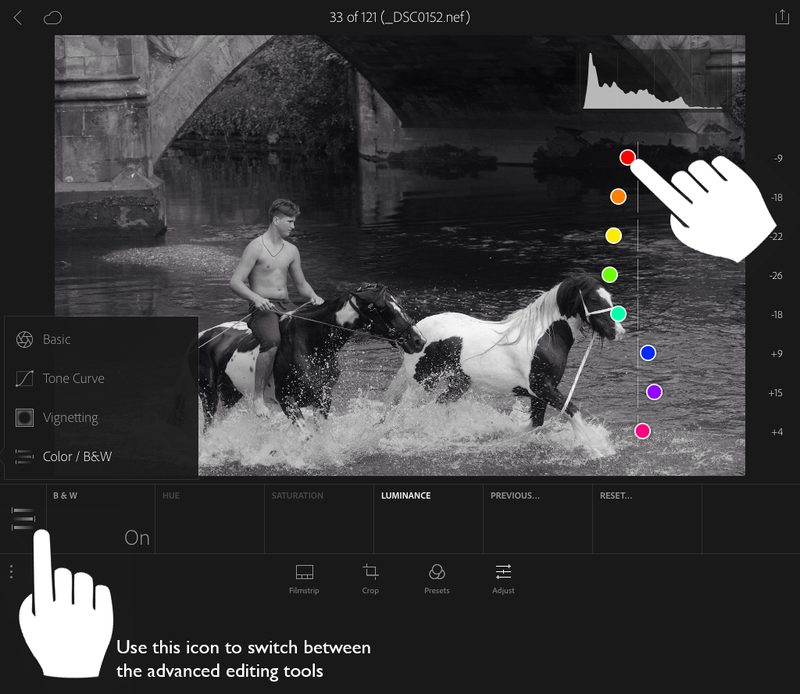 1.50 adds some important editing features – Tone Curve, Hue / Saturation / Luminance sliders, and B&W sliders. I’m delighted by the addition of the B&W adjustments as I do a lot of B&W and just didn’t like using canned presets. They were no substitute for doing B&W properly, choosing how the reds are rendered in greyscale tones, brightening or darkening them, maybe darkening a blue sky, tweaking how the foliage appears…. On the other hand I am less excited by HSL adjustments and the Tone Curve now being in LrMobile. Partly this is because I feel they make the app even more unbalanced, with lots of Develop features and very few ways to perform Library or organisational tasks like adding titles and captions or colour labels. Secondly, I find I mainly use LrMobile for reviewing pictures and showing my work to people I might encounter. Adjustment is a less important function for me, and I certainly prefer to adjust colour or the tone curve on a bigger, colour-managed screen. When I do adjust pictures or the iPad, I’m usually playing or experimenting and for this reason I’d love to have the ability to create virtual copies in LrM….